also, inspired by my belated Wire appreciation (i am still not over season 3 episode 11...), i'm hunting for some excellent mystery / crime fiction. any recommendations for titles by Dennis Lehane, or others? For mystery/crime fiction I really like P.D. James. Very English, kind of upstairs/downstairsy and pretty funny, too. They go fast but there are lots of them! The cat in that photo is just too much. Hehe. I'm jumping on the bandwagon and starting Gone Girl tonight. It made dozens of "Best of 2012" book lists, and film right have already been snatched up, so the buzz is definitely there. Heard it's a real page-turner. Oooh, Gone Girl is definitely a page-turner. Don't want to spoil anything so I won't say more, but...yeah. Pretty crazy stuff. just kids is AMAZINGGGGGG. i so recommend it. i just finished "A Feast of Crows" so I'm not sure what I should read next. I should really finish "A Casual Vacancy." Just Kids is wonderful, highly recommend it. I am reading about four books right now - a draft of a friend's novel, a book on India by two friends called Indianomix, Going to Extremes on extreme climates by Nick Middleton and How to Write a Sentence by Stanley Fish. All very good. Tara French writes some pretty awesome crime/mystery stuff. I've read and loved In the Woods, but I heard that Faithful Place is supposed to be even better. Fair warning, they are not what you would call uplifting, but they really do draw you in - I could barely put down In the Woods. oooh, thank you for these recs! i will definitely check TF out. never heard of CM, though that title is very compelling...will have to check it out! I loved Just Kids. I'm currently reading De Beauvoir's Memoirs of a Dutiful Daughter. I am reading Claire McCardell's "What Shall I Wear?" It's a lot of fun, and I recommend it. Just Kids is great; but I have no mystery recommendations right now. Just Kids was my most favorite book read in 2012. It's wonderful. i saw PS in concert some years ago. she is such an amazing, inspiring, fierce woman. 'Just Kids' is one of those books i think i'll be reading again and again. i loved it so much. at the moment i'm working through stephan fry's autobiographies (there's two). he writes just like he talks, which is entertaining on it's own, but he's also been in a lot of trouble, which makes for an interesting contrast with the very likable person he presents to the world. finished just kids in december 2012, i think. 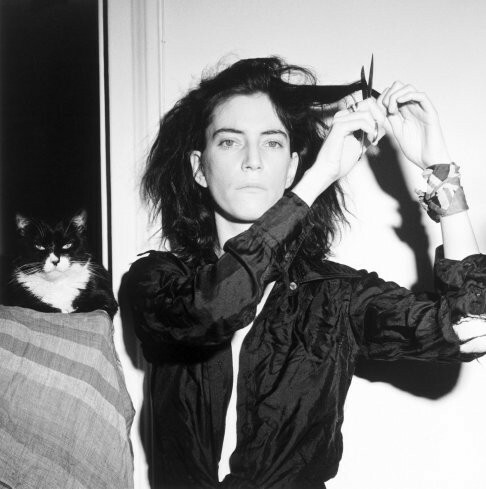 it's a beautiful read and quite a tribute to mapplethorpe. though i sometimes got confused with all of the names and people that crossed their paths, i am so impressed by the way each of the people really impacted the author in their own unique way. tell us what you think! Like everyone here, I love "Just Kids", and I second "Gone Girl" as a recommendation! A few days ago I reread "The Historian" by Elizabeth Kostova, and while it's not a crime thriller exactly, it's still a mystery you want to follow to the end and beautifully atmospheric - you'd be dying to visit Eastern Europe and Turkey by the end of it. Do give it a go if you haven't read it! I love "Here is New York." It's a book that I find myself re-reading (& quoting on the blog) beautiful prose and it's just amazing how timely and relevant it still is. I highly recommend it. I'm reading "Gone Girl" now and I'm almost done. Reread "In Cold Blood" while we were on holiday- always so good and the ultimate crime book for me. Next up I'm reading Grace Coddington's memoirs (I gave signed copies with little illustrations) for Christmas, Mary Blume's new biography on Balenciaga and yes, I have to read "Just Kids." the prose in ICB always gives me chills. remarkable to think that this is the same writer who gave us Holly Golightly! "Just Kids" has been on my reading wishlist for a while. I just love memoirs and diaries, "Memoirs of a Dutiful Daughter" mentioned by Alexandra, is one of my favourites. I'm reading "The Clothes They Stood Up In" by Alan Bennett right now, the story is quite bizarre but very funny and thought-provoking. As for crime/mystery fiction, I would suggest "Alex" by Pierre Lemaitre -a book with an unpredictable plot- or anything by Don Winslow. I'm a huge mystery/detective novel devourer, I eat it up like there's no tomorrow. Right now I'm reading The Likeness by Tana French, and can't put it down. I enjoyed her other book as well, Into the Woods, but I have a feeling that the endings in general drag on for her. The meat of her books though is quite worth it. Also agree with the others here, Gone Girl is an awesome gripping read! Try Jeffery Deaver. He wrote the Bone Collector and has a series focusing on the character played by Denzel Washington in that movie.